Served as an Electronics Officer in the US Navy from 1952 to 1956 stationed aboard several destroyers. Professor at Stanford from 1961 to 1965, teaching Electronics, Electromagnetic Theory & Ionospheric Physics. Skylab 3, July to September, 1973, Science Pilot aboard the second Skylab mission completing a two month stay including 3 spacewalks. Following his flight he served as Deputy Director and then Director of the Office of Science and Applications and then as the Assistant Director for Space and Life Sciences at JSC. STS 9, November 1983, Mission Specialist aboard the Spacelab 1 shuttle mission which featured the first international crew aboard a shuttle mission. From 1984 to 1986 worked as a Space Station Project Scientist. 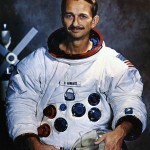 After leaving NASA, Garriott was the Vice-President of Space Programs for Teledyne Brown Engineering in Huntsville, Alabama. Co-founder and President of Immutherapeutics Inc. in Hunstville. On October 12, 2008, Owen Garriott’s son Richard launched aboard Soyuz TMA-13 to the International Space Station as a self-funded tourist, and returned to Earth 12 days later. 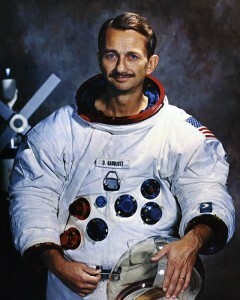 This made the Garriott’s the first father and son astronauts.